Most educators will tell you that to improve reading fluency you need to improve phonemic awareness, the ability to pick out phonemes, the sounds inside words. And to improve phonemic awareness your child needs to work on phonics. This is true enough. But what if your child cannot reliably connect letter sounds to text, what if even phonics is a stretch? Then what? That’s where our reading fluency programs can help. Improving reading fluency is challenging for many children because it requires a level of phonological awareness that they do yet not possess. Our software is all about helping close this gap. It presents language processing exercises to help improve the clarity of language, to make words less muddy and the phonemes more distinct. Think of it as a pre-phonics program. What Is Reading Fluency Exactly? Fluency is the ability to read with speed, accuracy, and proper expression.Fluent readers display prosody when reading aloud. Prosody is the ability to real aloud using phrasing, emphasis when appropriate and intonation to get across meaning. Fluency indicates automatic decoding, or not. Where the brain acts like a computer, matching text to word memory, decoding is not only easier, it’s faster. This is why words per minute is a fluency indicator. Teachers also track prosody as an indicator of automaticity. When you hear a child reading out loud in a slow and deliberate manner, you know he is having to concentrate on sounding out every word. Similarly, if a child reads in a monotone voice, without expression, reading is hard going. This is not fluent reading. Fluent readers, in contrast, do not need to concentrate on every word. They decode subconsciously and effortlessly. This allows them to focus instead on comprehending the text. Therefore, when they are reading aloud they can add emphasis and intonation to make the text more lively and to convey meaning. A reader who is fully occupied with decoding, concentrating on every word, has no such capacity for prosody. This difference is important because reading comprehension will always be a struggle if reading is not fluent. Just as the need to concentrate on the words interferes with the ability to add emphasis and inflection when reading aloud, it also interferes with the ability to extract meaning from the text and to think about what is being read. Even when reading silently. An analogy here is riding a bike. Learning is all about keeping the pedals moving, steering and maintaining balance. At first, riding is slow and unsteady. Furthermore you have no capacity to observe the scenery around you. However, once you learn, riding a bike is automatic. You don’t think about the mechanics. It’s easy, effortless, except on hills! Your mind is totally available for other things such as taking in the scenery. Decoding is exactly like that. It can be automatic. And in fact, until it is automatic, reading won’t be fluent and reading comprehension will suffer. Therefore oral reading fluency is about more than just decoding or reading speed. It is a precursor to and predictor of reading comprehension skill. This makes improving reading fluency a vital step on the road to lifelong reading. If your child can read with fluency, reading comprehension skills are much more inevitable. Another connection between fluency and comprehension is reading speed. Slower readers can lose track of the meaning over the course of a paragraph or page, leading to a lot of re-reading. Reading speed also impacts how working memory influences comprehension. Meaning is extracted from text that is retained in working memory. Slow reading makes it hard to fully load a sentence or paragraph into working memory before it is lost and the opportunity to extract meaning passes. And so, no doubt, reading speed or fluency are connected in may ways. Reading fluency is often the most common signal to parents that there is a reading problem. It’s not that easy however. Parents should be careful not to judge too early and be mindful of the text that their child is reading. However, if your child is not reading with fluency by 2nd or 3rd grade, they may indeed be a reading difficulty requiring attention. Without help, reading could become a turn-off. for your child The need for a struggling reader to multi-task — decode and comprehend — makes reading exhausting. And then it makes reading something to avoid. And if your child does not practice reading, he risk further even further behind. This escalating risk of a negative attitude to reading makes it even more of a priority to improve reading fluency. While most reading fluency programs focus only on phonics and language skills, our program is more comprehensive. It starts at a more deep-seated level with language processing, the foundation for phonemic awareness. Furthermore, it spreads wider, into other language skills such as vocabulary and language structure. A range of different exercises come together driving towards reading fluency and then to reading comprehension proficiency. Here are the individual skills addressed by our reading software, Fast ForWord. 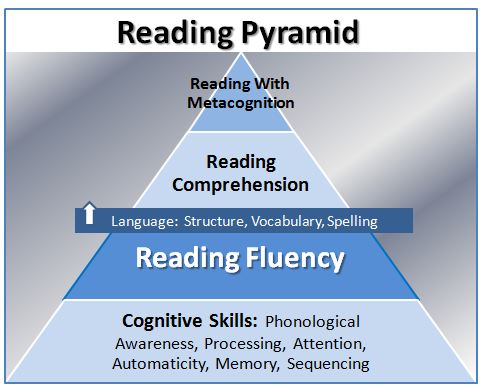 As you can see from the Reading Pyramid, reading fluency is a pivotal step on the way to reading comprehension with metacognition, the high school reading standard. The most important exercises in our reading fluency software work on cognitive reading skills at the base of the reading skills pyramid. 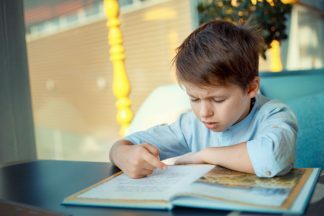 Reading fluency is only possible once auditory processing, phonological awareness, and other fundamental cognitive skills are functioning efficiently. Ultimately, improving reading fluency requires all words to become sight words. The brain learns to recognize every word in text format by using spelling patterns — spelling phonetically, then spelling rules, then spelling exceptions. Fluency requires being able to sound out words effortlessly, every time. Many of our students have grown used to skipping words and even worse, guessing. So, for them, this is a new and demanding skill to which Fast ForWord devotes a large amount of time. There are a number of so-called “red” words that can’t be spelled phonetically — words like ‘would’ and ‘because’ — that just have to be learned. The Fast ForWord reading program introduces and reviews these high-frequency words to ensure that students learn them. Development of left-to-right eye tracking begins in the cognitive skills stage of our program but is perfected here. The fluent reader is familiar with syntax, grammar, verb tenses and language conventions. Skilled readers use their strong processing skills to listen and analyze the language as they hear it in everyday life. This natural learning process is undermined by processing delays. Fast ForWord develops language structure familiarity, using a slowed down, adaptive natural learning approach. Sound reading fluency and comprehension skills go hand in hand. Our reading programs devote a great deal of time in the second phase to practicing reading comprehension with fluency, analytical tasks that can only be answered correctly if decoding is automatic, i.e., fluent. The step to high school level reading proficiency is to improve reading fluency. To find out if your child could benefit from our reading fluency programs, call for a free consultation.